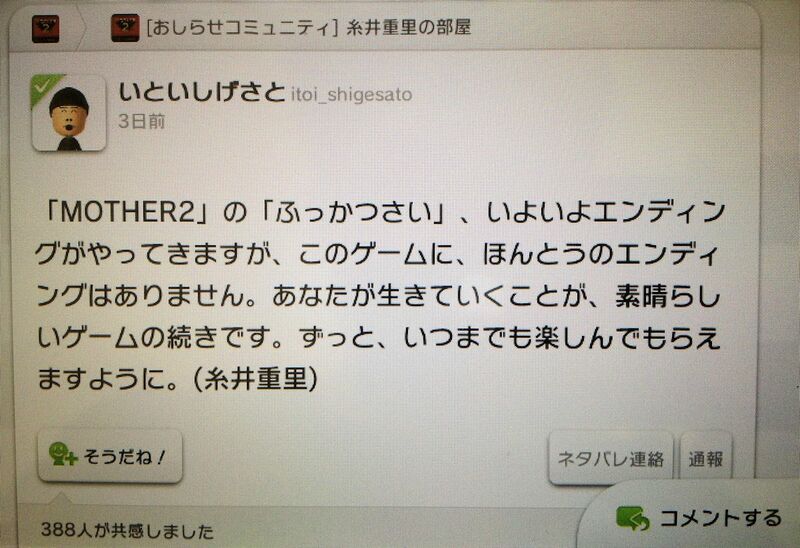 As Shigesato Itoi continues to post things on the Japanese MOTHER 2 Miiverse, I’ll update this page with pictures and translations of what he’s saying. I’m about to eat a banana that’s been sitting in 50 degree Celsius water for 15 minutes straight. ….Yum! MOTHER 2 is nice, but so is this banana. 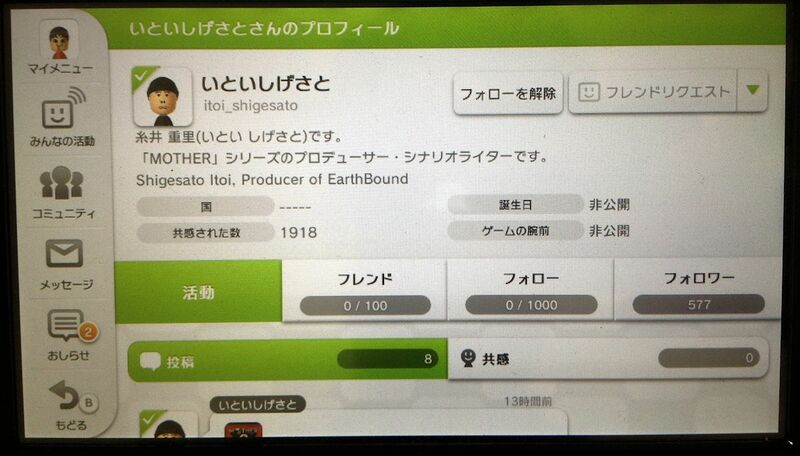 This is Shigesato Itoi. I’m going to begin posting now. I’m going to mix in some jokes too, so please try not to take it too seriously or swallow stuff in one bite. Gimme something. I was so focused on the banana, but the banana isn’t what I should’ve been focused on. Are you having trouble today because you’re so attractive to others? I took a short break, but I’m feeling really down now because we lost the WBC semi-finals. I just had some momiji manjuu. 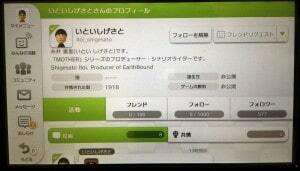 A discussion I (Shigesato Itoi) had with Mr. Iwata about “MOTHER 2’s revival” started on Hobonichi (www.1101.com) today. I’m trying to decide whether to go with drawn messages or with typed messages. I wonder if I should use them for different things. Besides the MOTHER 2 community, there’s a wonderful and not-necessarily bland and fart-smelling community called “Shigesato Itoi’s Room”, so you should visit it on occasion. From the actual me. I’ve eaten “sakura mochi” from Toraya twice now this year. They’re neither too overpowering nor too understated. They’re truly delicious. The MOTHER 2 revival is tomorrow. I typed out a sort of serious message now! “Treasure your name”, basically. You can see it from your Wii U too. You can just use the Internet browser it has. I’ve finally finished my normal work. I’ll be coming here soon. 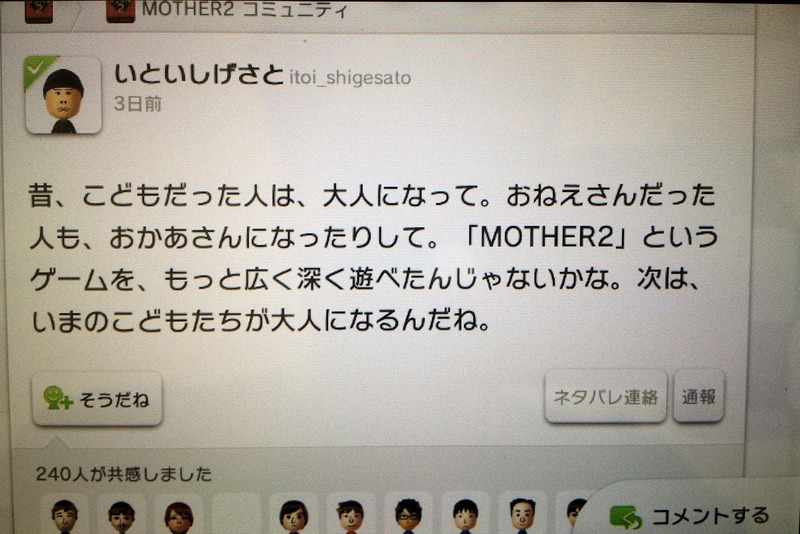 “Shigesato Itoi Plays MOTHER 2 Night” just ended. It was a lot of fun~ Thank you, BOSE and Mr. Toda. Thank you, everyone. Just dropping by the “MOTHER 2 Community”. Just popping in to take a peek. I just finished eating lunch. Stewed Hamburg steak. The Revival Festival is going to end soon. But the game will continue on. Forever. For lunch I had scallop porridge. I just had a Japanese rice cracker. People can tell when you’ve eaten a Japanese rice cracker because of the smell. 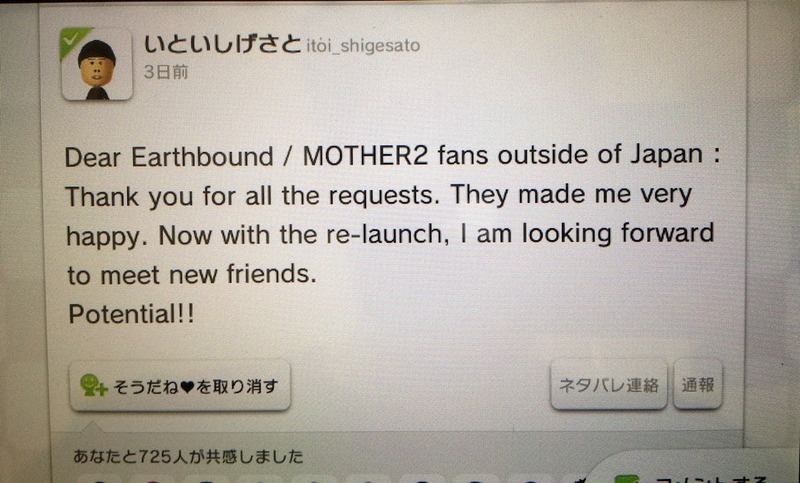 Dear Earthbound / MOTHER2 fans outside of Japan : Thank you for all the requests. Now with the re-launch, I am looking forward to meet new friends. Potential!! People who were kids back then and are now grownups… Big sisters then who might even be mothers now… I think MOTHER 2 probably resonated with these people the most of all. And now people who are currently children will get to grow up with it too.